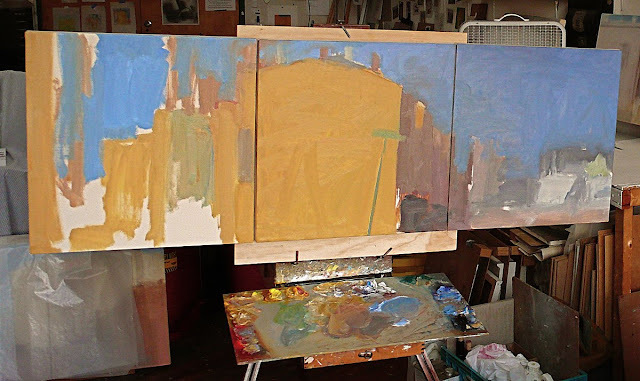 Of most importance for me, regardless of what is on the palette, is that the color mood of the painting is not the result of what specific colors are put out, but of what the painter can do with those colors to create a color complexion in the painting. 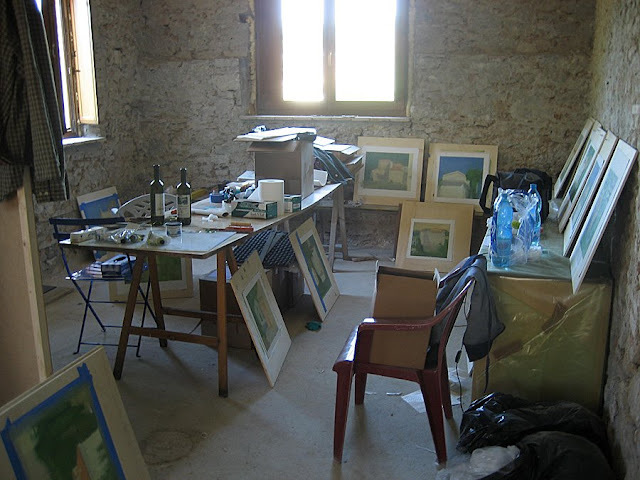 I use the same colors for night painting, day painting, painting in Italy, painting on the coast of Ireland, urban painting or rural painting — the idea being that the colors are like the tools in a stone mason's bag and it is the mason's job to use the tools to get the job done. Just because a landscape is green doesn't mean we don't have reds on the palette. Everything gets mixed with everything, the color is never even close to being right out of the tube, and the palette has to look like a battlefield, which it is. The warms and the cools, mixing it up in the middle, out of which comes color. But until the color is put down on the canvas there is still really no color. Color is something that cannot exist on the palette but only in juxtaposition in the painting itself. As a student I used a limited palette for working from life. At first, for 6 months it was a red earth, yellow ochre and ivory black. Of course, always making mixture piles between the colors so that the eye could see what the mixtures actually looked like, instead of trying to anticipate that intellectually. For instance, I might mix up two different combinations of red earth and yellow ochre, one more reddish and the other more yellowish. Greenish neutrals would be made on the palette adding black to yellow when the palette was laid out. After six months we added a quinacridone red, a hansa yellow or winsor yellow and a cobalt blue, and that really expanded the range of mixture possibilities. Later came Ultramarine Deep and Cerulean Blue. And Indian Yellow. Basically I used that palette for 20 years. However, when I left school, for several months I switched to a pure cadmium palette, but the expense was too much and I went back to what is basically and earth palette modified with prismatics. Since first year at school, I always set the palette similarly — warms across from cools. Red in the lower left corner, then orange ish or dark yellows, the brighter yellows going up around the top left corner. White sits in the middle of the top and then moving toward the right corner, a Viridian (my only green at this point, better to mix blues with yellows) and running down the right side top to bottom, Ultramarine Deep, Cobalt Blue, Cerulean Blue (NOT hue) and Ivory Black. I have always used black, except during that Cad palette period when I mixed black ish from a few other colors. I had a very traditional training and habits became ingrained early. My colors are not very snazzy, but it's only recently that my paintings have moved from tonal to more chromatically based. It has taken 25 years to begin to enjoy color. Being in Italy for the last 2 summers is responsible for that. I use a large piece of plexi and/or 1/4 inch glass with rounded edges, with white gesso underneath for luminosity. I've never used dark wooden palettes as I was told as a student that they were a vestige of when we painted on dark grounds in dark rooms and now we work on light grounds in strong daylight. Of course the palette gets stained even when cleaned up each day so it is never pure white. I work on light grounds so a light palette makes sense.I cannot read color or color mixture on a wooden palette. My white has evolved slowly over many years. All through school I made a 50/50 mixture of Flake or Cremnintz and Permalba (it's a titanium/zinc mixture). That slowly evolved into what I now use: some flake, some cremnintz (one is warm and one is cool and they have different densities and opacities), Permalba White and Flake White Replacement (Gamblin). Don't ask why, it is something that evolved by intuitive touch over 25 years, but easily more than half is Permalba and FWR. Often I think it's time to stop using lead, and I never recommend this to students, we are surrounded by enough toxicity. So a very good white is FWR (Gamblin) and Permalba, 50/50. I don't really care about brand, but finances dictate: always relatively inexpensive but not junk: Winsor &Newton, Rembrandt and Gamblin (when on sale). I cannot afford Old Holland or WIlliamsburg. I use a medium made up of cold pressed linseed oil, stand oil and turp. But I never, ever put out a medium cup - the stuff gets mixed in with the big pile of white and that's all there is. I don't like a shiny surface and tend to work opaquely with no transparencies. I have never used raw umber or burnt umber or any brown. We can mix many more beautiful browns on the palette while at work, more chromatic browns, than anything out of a tube. I detest the idea of brown on the palette. But that is probably because I came out of a "secrets of the old masters" camp as a student and this is the reaction.